iHeartRadio, the online radio service, recently announced its paid on-demand All Access plans and it's now officially making them available (even though they have been accessible for almost a month). But that's not what we're here for. Another announcement coming from the company at CES is its upcoming integration with Google Home and a few other hardware and software partners. Google Home support isn't live yet, but when it becomes available, you'll be able to play iHeartRadio stations or artists by asking the Assistant to do so. It looks like the integration will be direct, like Spotify works now, without requiring you first to speak to iHeartRadio and then ask for a station, but that's an assumption based on the vague PR description. Things could be different. iHeartRadio is also coming to Samsung's Family Hub, the company's smart refrigerator line-up that's probably way too expensive for any of us to even care about, and the Samsung Gear S3 (more in our budget range). Users will be able to listen to music directly from their fridges — we live in the future, folks! — or control playback from their smartwatches. The last two partners announced are DISH Music and Speak Music Melody, which are apps for DVRs and iOS, respectively. LAS VEGAS--(BUSINESS WIRE)--iHeartMedia, creator of iHeartRadio – the all-in-one streaming music and live digital radio service — today announced five new integrations at the Consumer Electronics Show. These integrations will provide iHeartRadio’s more than 95 million registered users with new ways to access iHeartRadio’s vast collection of live radio, custom Artist Radio stations, podcasts and more. Google Home: Listen to iHeartRadio on Google Home, the voice-activated speaker powered by the Google Assistant. 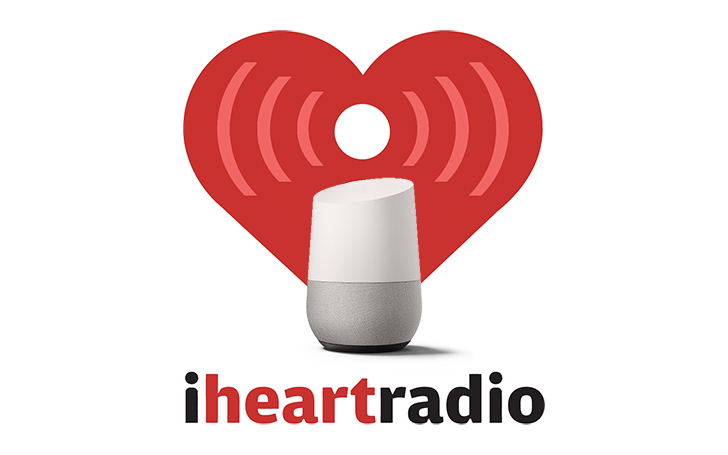 Coming soon to Google Home, playing iHeartRadio will be as easy as saying “Ok Google” followed by your favorite radio station or artist, giving users access to thousands of iHeartRadio’s live radio stations and millions of songs, with podcast functionality coming soon. Samsung Family Hub: A new integration with Samsung Family Hub will allow users to listen to iHeartRadio stations right from their refrigerator. Samsung Family Hub features a touch-enabled screen that resides on the door of a Samsung refrigerator, creating a focal point for families to share notes and photos, coordinate calendars, and now - listen to their favorite music via iHeartRadio. Through this integration, families can enjoy live radio stations, personalized custom Artist Radio stations, and other great iHeartRadio content through the iHeartRadio application. You can check out a demo on the CES show floor, Central Hall, booth 15006. Samsung Gear S3: With the Gear S3, the smartwatch that’s engineered for adventure, iHeartRadio users can control their music listening experience right from their wrist. This integration with Samsung gives Gear 3 users free access to thousands of live radio stations, custom Artist Radio stations and podcasts, on top of all of the core features of the Android iHeartRadio app. DISH Music: Recently launched by DISH, DISH Music is a new mobile app powered by DTS Play-Fi that provides a complete, room-to-room music entertainment experience by enabling users to stream music on TV audio systems throughout the home and control this content via their Android or iOS smartphones and tablets. Through an integration with iHeartRadio, DISH Music users can now enjoy thousands of live and custom Artist Radio stations, as well as podcasts from iHeartRadio, syncing the same music across rooms, or playing different stations throughout the home. DISH Music will be available on all Hopper 2 and Hopper 3 DVRs. You can see a demo on the CES show floor, Central Hall, booth 11421. Speak Music Melody: iHeartRadio and Speak Music have teamed to launch Melody, a hands-free listening experience. Melody is Speak Music’s new voice-enabled platform that gives users the ultimate hands-free listening experience via a free iOS app — a personal music assistant with access to millions of songs and thousands of radio stations. Melody is the perfect solution for the music lovers on the go who can now connect with a vast selection of audio and musical content while multitasking, driving and working out, all with the convenience of simple voice commands. Through this integration, Melody users will be able to listen to iHeartRadio’s live and custom Artist Radio stations through the Melody app or via connected Bluetooth enabled iHome devices. CES delegates can also experience two auto concept integrations; Alexa Voice Services within Ford Sync (Ford booth 5002, North Hall) where drivers will be able to use their voice to play their favorite iHeartRadio live and custom Artist Radio stations in the car; and a Qualcomm integration (booth 5609, North Hall) that puts delegates inside a Maserati to experience seamless listening transition from AM/FM radio to streaming radio with the iHeartRadio app when the car drives out of tower range. Today, iHeartRadio also announced that it officially released its two new on demand services, iHeartRadio Plus and iHeartRadio All Access powered by Napster, the first fully differentiated streaming music services that use on demand functionality to make radio truly interactive. The two new services are available on iOS and Android with iHeartRadio All Access powered by Napster now available on desktop and select consumer electronic devices. Aside from the two new subscription on demand services, iHeartRadio will remain free. iHeartRadio offers users thousands of live radio stations, personalized custom Artist Radio stations created by just one song or seed artist and the top podcasts and personalities. With over a billion downloads, iHeartRadio has had tremendous momentum — reaching 85 percent brand awareness among consumers in less than 5 years as well as 95 million registered users faster than any other radio or digital music service — and even faster than Facebook. With over a quarter of a billion monthly listeners in the U.S. and over 85 million social followers, iHeartMedia has the largest national reach of any radio or television outlet in America. As the leader in multiplatform connections, it also serves over 150 local markets through 858 owned radio stations, and the company’s radio stations and content can be heard on AM/FM, HD digital radio, satellite radio, on the Internet at iHeartRadio.com and on the company’s radio station websites, on the iHeartRadio mobile app, in enhanced auto dashes, on tablets, wearables and smartphones, and on gaming consoles. iHeartRadio, iHeartMedia’s digital radio platform, is the fastest growing digital audio service in the U.S. and offers users thousands of live radio stations, personalized custom artist stations created by just one song or seed artist and the top podcasts and personalities. With over a billion downloads, iHeartRadio reached 95 million registered users faster than any other radio or digital music service and even faster than Facebook. iHeartMedia’s platforms include radio broadcasting, online, mobile, digital and social media, podcasts, personalities and influencers, live concerts and events, syndication, music research services and independent media representation. iHeartMedia is a division of iHeartMedia, Inc. (OTCBB:IHRT). Visit iHeartMedia.com for more company information.